The Book of Abraham is part of the “Standard Works” or written Scriptures of the Church of Jesus Christ of Latter-day Saints. It is also one of the most controversial issues in Mormonism, responsible for many life-long, faithful Mormons questioning their religion. This article provides a basic, up-to-date introduction to the subject. At the end of this article are suggestions for those who would like to learn more. What Is the Book of Abraham? In 1835, Joseph Smith and the LDS Church purchased some ancient Egyptian mummies and papyri from a traveling salesman because when Joseph first examined the papyri he identified them as containing the writings of the Genesis patriarchs Abraham and Joseph. Joseph worked on his “translation” of a portion of the papyri in 1835 and resumed work on it in 1842. That same year he published as three articles in Times & Seasons what he had completed, with the title “The Book of Abraham.” It consists of five chapters and three “facsimiles,” or reproductions of drawings from the papyri along with Joseph’s “explanation” of what each drawing represented. The Book of Abraham later became part of the Mormon scripture called the Pearl of Great Price. What Is in the Book of Abraham? The Book of Abraham begins with a story (not in the Bible) about the Lord rescuing Abraham from the priest of Pharaoh when he tried to kill Abraham on an altar in the land of Chaldea (Abraham 1). Joseph interpreted Facsimile 1 as a depiction of Abraham on the altar. The next chapter is parallel in content and to a great extent in wording to Genesis 11:28-12:13, though it is twice as long as the Genesis passage. In the Book of Abraham version, the Lord told Abraham to ask Sarah to cover up the fact that they were married in order to avoid being killed when they were in Egypt (Abraham 2). The next chapter is an account of a revelation Abraham received before he went to Egypt about the stars, including a great star called Kolob near where God resides, and about the “intelligences” or premortal spirits of human beings that existed before the earth was organized (Abraham 3). Joseph interpreted Facsimile 2 as a representation of Abraham’s astronomy and Facsimile 3 as a depiction of Abraham sitting on Pharaoh’s throne while he explains the principles of astronomy to Pharaoh. (The text of the Book of Abraham does not narrate this story.) The final two chapters closely parallel Genesis 1-2, but they speak of “the Gods” instead of one God, and they say that the Gods “organized” the heavens and the earth (Abraham 4-5). What Happened to the Papyri? After Joseph Smith died, the papyri were sold, split up into separate collections, and dropped out of sight. Most of the papyri were likely destroyed in the 1871 Chicago fire, but some fragments passed through the hands of private owners and in 1947 were sold to the Metropolitan Museum of Art in New York. In 1967 the museum gave the papyri fragments to the LDS Church. What Is on the Papyri? The papyri fragments contain passages from two pagan Egyptian funerary texts: a Book of Breathings Made by Isis (an Egyptian goddess) and chapters from the Egyptian Book of the Dead. The papyrus containing the Book of Breathings (called the Breathing Permit of Hôr, after the name of its Egyptian owner who was mummified with the papyrus) includes the vignette that was reproduced as Facsimile 1. Egyptologists identify the vignette as a common Egyptian scene depicting two Egyptian gods—Anubis (the god of mummification) standing over the body of Osiris (the god of the afterlife), bringing it back to life as it lay on a funeral bier. Such documents were placed with mummified bodies to represent the deceased individual’s safe passage to the afterlife. The papyri have been dated to the second century bc, about eighteen centuries after Abraham. Papyrus Joseph Smith I, the fragment containing the vignette represented as Facsimile 1. Note the sketching made on the backing on which the fragment had been mounted to fill in missing elements on the assumption that it depicted a priest attempting to sacrifice Abraham. Is There Anything about Abraham on the Papyri? No. By 1968, both Mormon and non-Mormon scholars had completed translations of the written texts of the papyri and found in them no references to Abraham or to anything of historical relevance to Abraham. The LDS Church, however, made no statement on the matter, leaving some Mormons to speculate over the next few decades that the scholars might have been wrong or that the papyri might have contained the Book of Abraham in a coded or hidden meaning in the text. Finally, on July 9, 2014, The LDS Church issued an article on its official website LDS.org entitled “Translation and Historicity of the Book of Abraham.” This was another article in a series of articles on “Gospel Topics” addressing issues that have been problematic in the LDS Church. This new article admitted the fact, known for 46 years, that the text of the Book of Abraham does not correspond in meaning to the text of the extant fragments of the papyri from which Joseph Smith had purported to translate it. The new article on the LDS.org website admits, “Mormon and non-Mormon Egyptologists agree that the characters on the fragments do not match the translation given in the book of Abraham.” However, some Mormons still argue, contrary to all other Egyptologists, that the vignette represented by Facsimile 1 may have been about Abraham on a pagan altar as claimed in the Book of Abraham. Might the Text of the Book of Abraham Have Been on Some of the Missing Papyrus? No. Abraham 1:12 says explicitly that the vignette called Facsimile 1 appeared “at the commencement of this record.” In other words, the drawing is said to have been located on the papyrus at the beginning of the Book of Abraham. This means that the Egyptian text that follows the vignette on the papyrus should be the Book of Abraham, but it is not. Might the Papyri Have Been the “Catalyst” for Joseph Receiving the Book of Abraham as a Revelation? 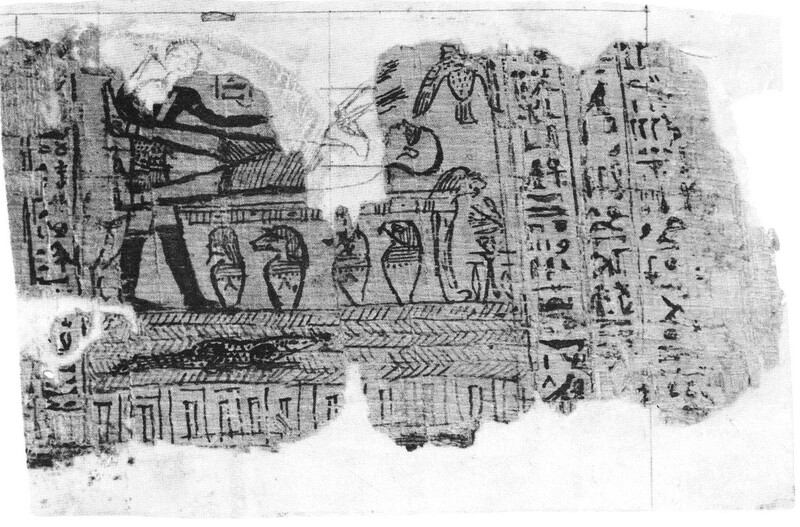 As the new LDS.org article explains, according to this theory, the papyri did not contain the Book of Abraham but instead “catalyzed a process whereby God gave Joseph Smith a revelation about the life of Abraham, even if that revelation did not directly correlate to the characters on the papyri.” The theory is not credible for the simple reason that Joseph Smith consistently identified the papyri themselves as containing the writings of the patriarchs Abraham and Joseph. He also consistently described the Book of Abraham as a translation of the papyri (which he even said had been written in Abraham’s own hand). Advocates of the “catalyst theory” must claim that Joseph Smith himself did not know what he really had or what he was really doing, despite his clear claims to have been translating the papyri. Could the Book of Abraham Represent Authentic History about Abraham? No. The Mormon apologetic argument here is that even if the Book of Abraham did not derive from the text of the Joseph Smith Papyri, he must still have been inspired to write the book because supposedly it contains historical information that Joseph Smith could not have known. However, professional Egyptologists outside the LDS religion uniformly disagree with this claim. For example, the Book of Abraham’s claim that the Babylonians at “Ur of the Chaldees” practiced Egyptian religion in the early third millennium bc is clearly unhistorical. The people of Mesopotamia at that time were indeed polytheists and worshiped idols, but their pagan religion took a different form than that of ancient Egypt. According to the LDS.org article, “The book of Abraham is consistent with various details found in nonbiblical stories about Abraham that circulated in the ancient world around the time the papyri were likely created.” To the extent that is the case, it is not support for the historical authenticity of the Book of Abraham but rather creates another problem, since the papyri were written about 1,800 years after Abraham. No historian thinks that the apocryphal stories about Abraham circulating almost two millennia after he had lived have any historical credibility. If Joseph Smith Was Not Inspired to Produce the Book of Abraham, Where Did Its Contents Originate? The idea that Abraham taught astronomy to the Egyptians derives from apocryphal lore about Abraham reported in various sources, including the first-century Josephus’s Jewish Antiquities, to which Joseph Smith and his associates had access. In 1835 Joseph Smith’s associate Oliver Cowdery cited Josephus when explaining the significance of the drawings on one of the papyri. An endnote in the LDS.org article admits that “some of these extrabiblical elements were available to Joseph Smith” and even mentions Josephus specifically, but asserts that “it is unknown whether he utilized” such sources. What Difference Does It Make If the Book of Abraham Is Not Authentic? It makes a lot of difference. We may mention just some of the ramifications here. First, the Book of Abraham is proof that Joseph Smith did not have a supernatural gift of translation. That is a crucial point, since Mormonism was founded on his claim to have translated the Book of Mormon “by the gift and power of God.” The Book of Abraham is a “smoking gun” demonstrating that Joseph’s claim to be an inspired translator was fraudulent. Second, since the Book of Abraham is not authentic, there is no reason to accept its doctrinal teachings as inspired by God. At least three major doctrinal errors are taught in the Book of Abraham: (1) Human beings existed before the formation of the earth as “intelligences” (Abraham 3:22-26). (2) The world was formed by multiple “Gods” (Abraham 4). (3) The lineage of Ham—meaning black people—were ineligible to receive the priesthood because a curse was on them (Abraham 1:21-28). It should be noted that the LDS Church, in another of its recent Gospel Topics articles, denied that blacks were ever under a curse—implicitly throwing out the teaching of the Book of Abraham on this point. The Institute for Religious Research (IRR) has produced a number of resources on the Book of Abraham that have helped many thousands of Mormons recognize that Joseph Smith’s claim to be an inspired translator and prophet was false. These resources include Charles Larson’s book By His Own Hand upon Papyrus—the first publication to provide full-color photographs of the Joseph Smith Papyri—and the award-winning documentary The Lost Book of Abraham. They can be read or viewed from our Book of Abraham page and can also be obtained as a printed book and a DVD. In addition, we highly recommend The Joseph Smith Papyri: A Complete Edition, by University of Chicago Egyptologist Robert K. Ritner, with contributions by three other scholars. It is now the definitive academic reference work on the subject. Professor Ritner also wrote an excellent, lengthy critique of the new LDS.org article on the Book of Abraham, which he has graciously permitted us to place on our website.